The Nonstop rally destroyed all kinds of resistances on first try. Given this bullish action, I have to accept the fact that wave4 — however short it was is over and we are now in 5th wave up. I was hoping for a retest of 2012, but when the 10:30am oil number came out and moved the market up, things changed. The same thing happened at the 1800 bottom on February 11/12: oil news came out and reversed the market violently to the upside with no signs of retrace–putting a bottom in the market. It did that again yesterday at 10:30am when the oil numbers came out. As much as I would like the 4th wave to continue, I have to accept the fact that we broke to new highs — and that the likelyhood of us being in an expanded b-wave high before a c-wave down is very slim. Instead, we may be heading to the 2080-2100 region in a 5th wave up earlier than I expected. We might even break 2100. The issue with 3rd waves is they generally don’t have recognizable patterns inside. Usually it’s the 1-2 setup that is clear –but in this case, the the 1-2 setup was awkward and different from the variations I usually see. 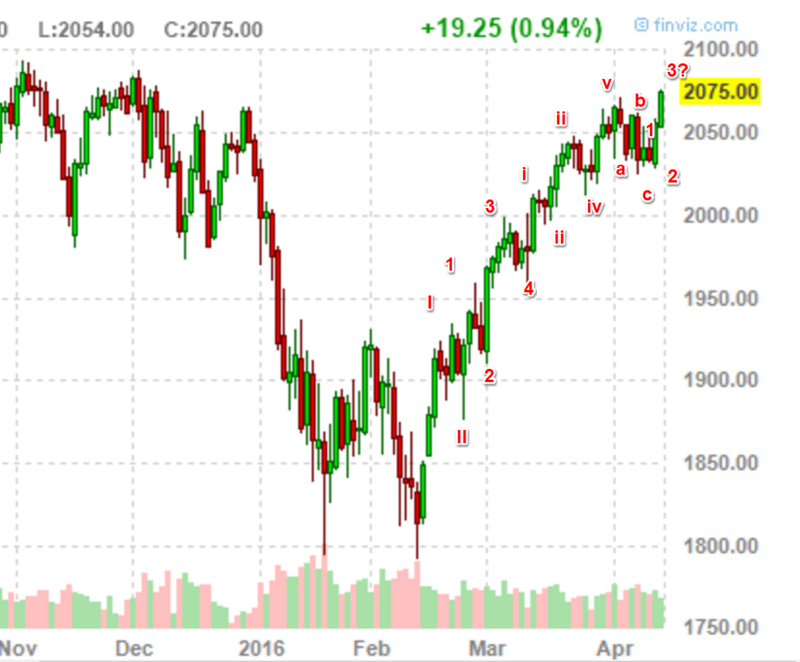 Still, have to accept it for what it is and understand that we are in a 3rd wave up of a 5th wave. Despite the super awkward setup of this 3rd wave rally — I have to accept it for what it is. If you look in mid February – the marke talso had huge green candles — 3 of them before a red candle formed. So far, here in April, we have 2 big green candles. A 3 rd one is not guaranteed, but it’s possible.